Here's a logo that me and Melanie Roher designed for a pilot television show. The logo was first designed in Illustrator with flat letters. Then the letters were extruded and textured in my favorite 3D program. The letters, lights, and camera were then adjusted and moved into position to make them look more "collected". Shadows were rendered against the backdrop using alpha transparency masks. The logo was also animated for the pilot opening. I did a quick animation with the 3D text while rendering alpha channels as well. Then brought that into a 2D animation program and added the swoosh and background image. The letters fall from the sky and then a lense flare makes the "i" appear just as the swoosh dissolves in from the right. Seen to the left is the set where the program was filmed. I was the guy controlling that little monitor on the table there. This was filmed in a prop house in New York City. I also designed the screens that appear on the monitor. 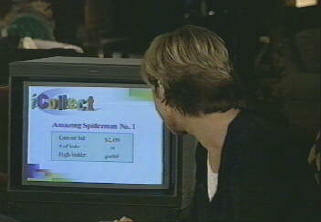 The idea is that the hosts are watching the computer screen as people are bidding for the items online. By the way, that's Kathleen Murphy and Keith Hernandez hosting the show.